Mr. Abdullah bin Ibrahim Al-Khalaf is the President of Arrowad Group and the General Supervisor of Arrowad national and international schools. Mr. Al-Khalaf has a bachelor degree in history from Imam Muhammad bin Saud Islamic University. 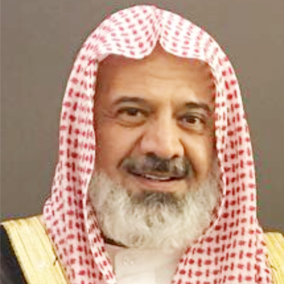 He served in Riyadh Educational Administration for many years and in a number of posts progressively until he became the Assistant Director General for Educational Affairs. Mr. Al-Khalaf made numerous contributions to the national education system. The pinnacle of these contributions was founding Arrowad Educational Establishment in 1990. This endeavor started by establishing Arrowad Schools in Riyadh then expanded the institute to include a number of schools offering national and international curricula in the Kingdom and in the Arab world. Mr. Al-Khalaf bin Ibrahim Al-Khalaf participated in number of supervisory and planning committees at the Ministry of Education. He headed the National Committee of Private Education in its first constituent session, participated in official delegations outside the Kingdom, supervised a series of scientific studies and advisory services in the Kingdom and in the Arab world, and frequently participated in conferences and scientific meetings related to education and human development.